I want to spray valor sx and dual magnum on peanuts this morning. Is there any problem with the valor and the rain that is coming? No, this is actually better. If you get them sprayed right after planting and then get rain for activation right after spraying you minimize the injury potential. 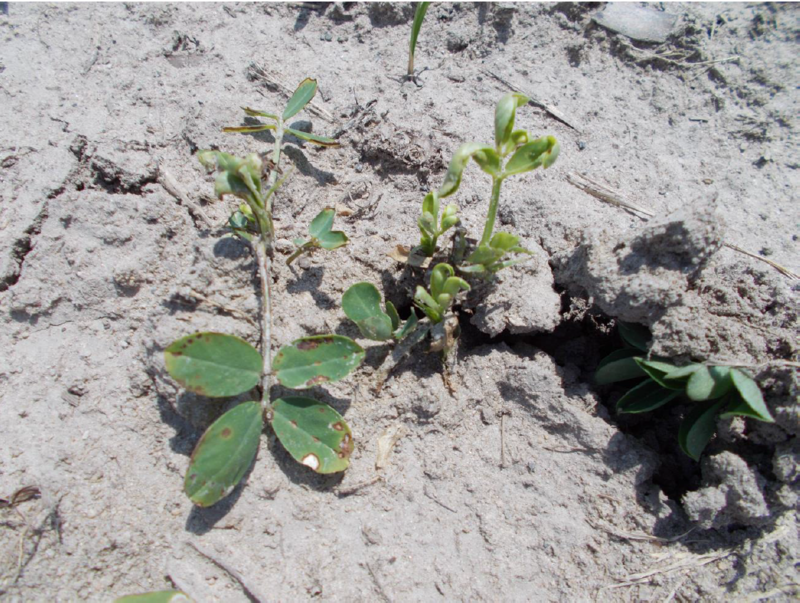 The greatest risk of injury is when the peanuts are planted, they are sprayed sometime before emergence but rainfall does not occur until the time they are coming out of the ground or are already emerged. This is the splash-up injury you often hear people talking about. In Georgia under center pivot they very often plant into relatively dry soil, spray PRE herbicides and then irrigate for germination and emergence. The weed control is generally really good in this situation. We still recommend 2 oz/acre of Valor SX, applied in most cases with Dual Magnum or generic metolachlor. As a side note, Valor SX works good in soybean but do not mix it with Dual Magnum or metolachlor products. Unlike peanut, for some reason this combination can really stunt soybeans. Planted on the 7th any problems? No, the label says apply within 3 days after planting. In reality, if you sprayed a few days before they emerged and got rain before they came up you would be in good shape. To minimize injury, it is mostly about getting any soil splash caused by rain before the peanuts emerge. Applying as far ahead as possible increases the likelihood of getting some movement of herbicide into soil before emergence through rainfall. Also more time for some of the herbicide to adsorb to soil making less of it splash up when the peanuts are up.